Last edited by 3leggedturtle on Tue Oct 23, 2018 11:50 pm, edited 1 time in total. An 80 OM, perhaps. This one is a 'Hunter' and doesn't have the more domed and graduated target knobs. According to Stroebel in his book 'Old Gunsights', "most are unmarked as to application and that shipping boxes were marked for model, application and special features." 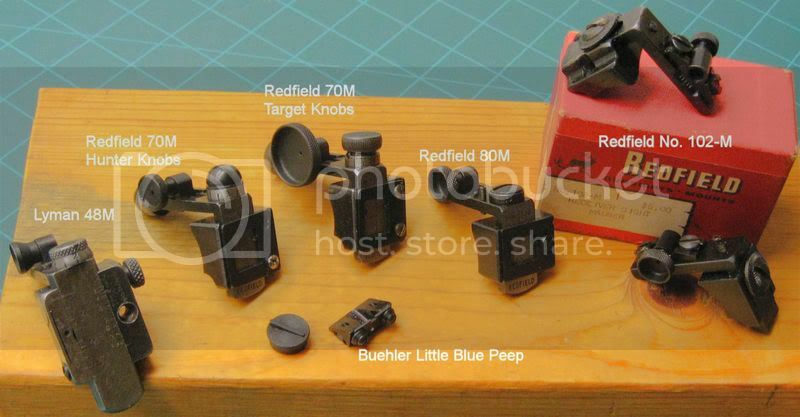 Yep - While the Redfield 90-OM & 102-OM fits Winchester 94 & Marlin 336 factory receiver sight prep holes, only the 70-OM Hunter had round knobs (the other 2 having flatter or completely flat topped knobs). Tango, mine has the more rounded knobs like the 70M Hunter. I always liked the look of the old Redfields. Strangely, I've never owned one. I've always had Lyman 56, 66, and tang sights. I am looking for a Redfield for my Marlin 1894CB that is pre-drilled. yeah, holler at me when ya can! !